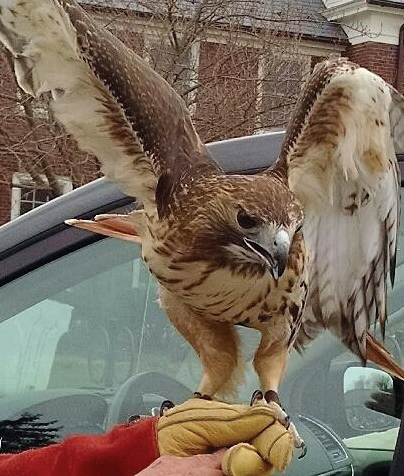 A red-tailed hawk saved by the Pocono Wildlife Rehabilitation & Education Center. PEEC is a hands-on nonprofit organization that aims to facilitate learning about the natural world for individuals of all ages and backgrounds. Located within the Delaware Water Gap National Recreation Area in Dingmans Ferry, this facility is only 30 minutes from campus. PEEC is on the lookout for instructors and interns, which are integral in leading activity sessions in a range of topics, which include aquatic or forest ecology, wildlife studies, geology, and environmental stewardship. Instructors and interns will also be expected to lead teambuilding activities, canoeing, and interpretive hikes. Qualifications for instructor positions include a college degree in environmental studies, biology, ecology, education, or a related field. Prospective interns should be enrolled in similar fields at his or her university. PEEC can arrange to partner with the intern’s university or college in order to provide academic credit. Certifications in first aid, CPR, AED, and lifeguarding are desirable for both positions. In addition, the most qualified candidates will have relevant teaching experience, be able to work in groups as well as individually, and have a positive attitude. Employment begins in May and can last for three to ten months. If interested, send a resume and cover letter to PEEC’s Director of Education, Allison Owczarczak, at alozark@peec.org or 538 Emery Road, Dingmans Ferry, PA 18328. Cover letters should state what position you are interested in, your qualifications, and the time frame in which you are looking to complete the internship. Located about 20 minutes from campus in Stroudsburg, PA, the Pocono Wildlife Rehabilitation & Education Center is searching for students interested in a summer internship and volunteering opportunities. The facility, located outside of Wind Gap, takes in wildlife from the Poconos that are sick or injured with the intent of rehabilitating them and releasing them back into the wild. The wildlife center also offers a number of live wildlife educational programs that use animals that are unable to be released to the wild. This summer internship, which runs until August 30 at the earliest, comes with a one bedroom, furnished apartment for the accepted intern. The intern will be expected to help maintain the wildlife center and the animals in its care. The amount of hours the intern will work is flexible, although students are required to work for a minimum of two to three hours per day, every day of the week. If able, working more hours per day comes with added benefits. For four hours a day, the wildlife center will pay for the apartment’s electric bill, which can reach up to $75 per month. For five hours a day, they will pay the intern’s cable and Internet bill. For seven hours a day, the intern will receive $100 per month. To qualify, applying students must provide a clean criminal background check, must not be afraid to work around wild animals, cannot smoke or drink, and cannot be allergic to any animals, including cats and dogs.